France’s President Francois Hollande has warned that there is “little time” to prevent Greece from leaving the eurozone. On a visit to Algiers, Francois Hollande said the ball was firmly in Greece’s court. “It’s not France’s position to impose on Greece further cuts to smaller pensions, but rather to ask that they propose alternatives,” the French president said on June 15. Talks with Greek and EU officials in Brussels on June 14 failed to reach an agreement that would release bailout funds to Greece. Eurozone finance ministers will meet on June 18, but Greek Finance Minister Yanis Varoufakis said he did not plan to present new proposals at the meeting. The prospects of a Greek default in just over two weeks’ time has worried investors. On June 15, the FTSE 100 in London fell 1.1% to 6,710 points, while the DAX in Frankfurt lost 1.9% and the CAC 40 in Paris shed 1.75%. In the US, the Dow Jones closed down 0.6%, or 107 points, at 17,791. Athens’ benchmark ATG index, which fell 5.9% on Friday, fell a further 4.7% on June 15. Greek bank stocks were hit hardest, with National Bank of Greece closed down 5.7% and Bank of Piraeus was 12.2% lower. 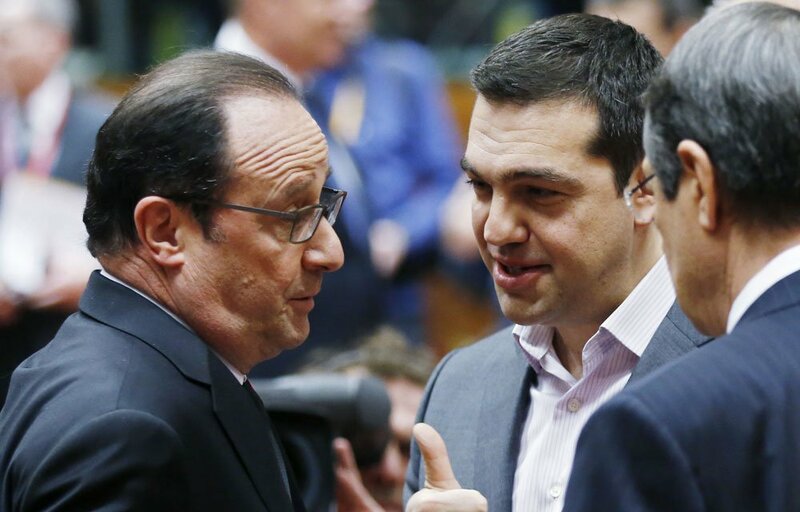 Europe wants Greece to make spending cuts worth €2 billion to secure a deal that will unlock bailout funds. Greece must repay more than €1.5 billion of loans to the International Monetary Fund (IMF) at the end of June and promise further economic reforms to receive about €7 billion of bailout funds. The funds have been delayed by three months amid growing fears the government will soon run out of money. Sticking points between Greece and the IMF and EU remain reforms to VAT and pensions. European Commission spokeswoman Annika Breidthardt rejected an assertion that creditors were seeking pension or wages cuts. They only wanted Athens to phase out early retirement and remove “incorrect incentives for early retirement”. Greece had already agreed to specific targets for its primary surplus, she said, with 1% of GDP this year, followed by 2% in 2016 and 3.5% by 2018. An opinion poll for Greece’s Mega TV found that more than two thirds of respondents believe the Greek government will have to back down, with just 19.4% thinking the lenders will agree to further concessions. On June 15, Greek PM Alexis Tsipras warned Athens would stand its ground until its creditors become “realistic”.